A car bomb explosion in a packed market near Baghdad has killed at least 48 people and injured nearly 50, local medics and officials said. 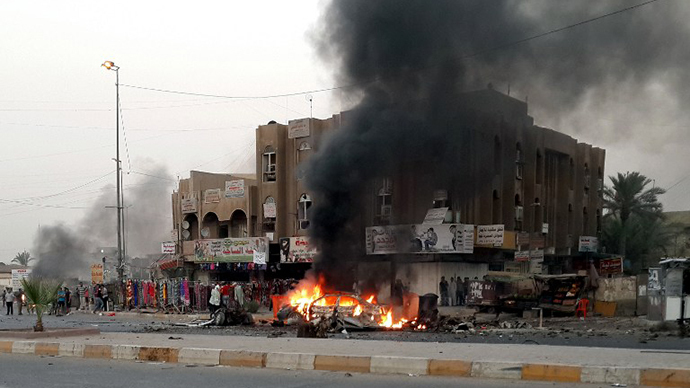 Thursday’s attack took place in Saadiyah, a town in the Diyala province, northeast of Iraq’s capital. "I was sitting in my store when I heard a huge explosion. I could not recognize anything because dust engulfed the place. Shattered glass was everywhere," Reuters cited grocery store owner Suhair Gadhban as saying. The bomb went off at about noon and targeted the food market, located in a neighborhood populated mostly by Faylis, or Shia Kurds, according to officials. Local police cited witnesses as saying that a man parked the truck containing the bomb in the market, and asked workers to unload the vegetables before leaving it, AP reports. "Some of them [were] killed and others were seriously wounded and were screaming for help," Suhair told Reuters by phone. A number of casualties have been confirmed by two medical officials, who spoke on condition of anonymity because they were not authorized to speak to the media. 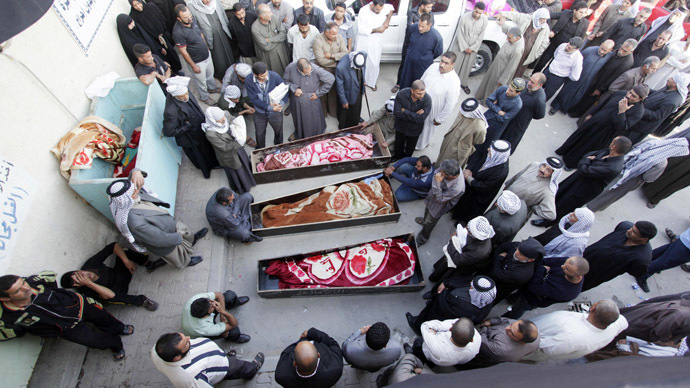 The attack brought the death toll across the country this month to almost 500 people, according to Iraqi Body Count. 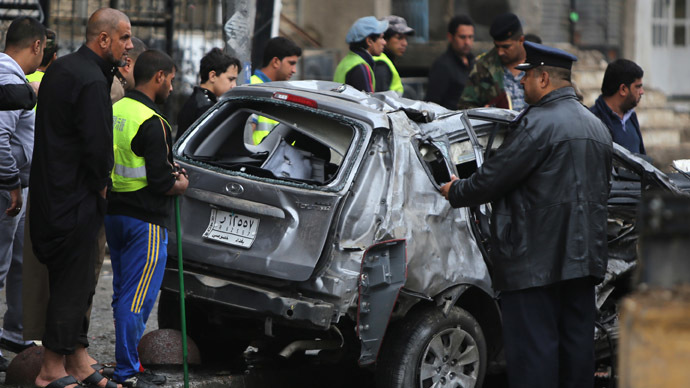 The recent violence a day after a series of attacks, mostly by car bombs, hit predominantly Shiite and commercial areas of Baghdad, killing at least 24 people and wounding another 87. With over 7,000 civilian casualties recorded in the year through the beginning of November, 2013 has become the deadliest year in Iraq since 2008. 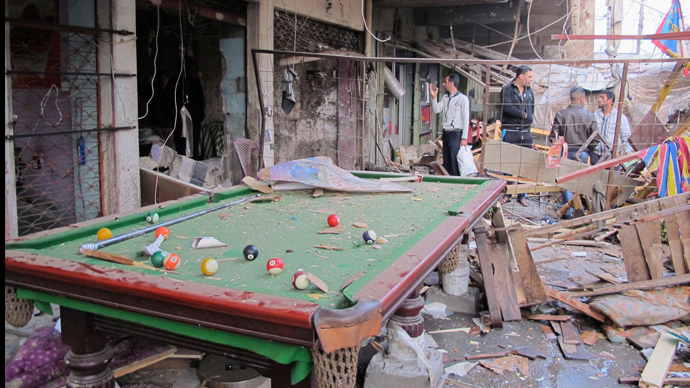 Every month hundreds of Iraqis are being killed in violence nationwide. The frequency of bomb attacks has raised fears that the country could be sliding towards sectarian bloodshed similar to in 2006-07, when tens of thousands died. In October, the United Nations put the death toll at 979 Iraqis killed and 1,793 civilians injured in attacks within that month alone, with Baghdad being the worst affected area. “Every day, every week, every month, dozens, if not hundreds, of innocent Iraqis are killed or deeply wounded. This is senseless,” the UN said then.